I met the author Jessica Redland at a recent author and blogger get together in York. While we were chatting about her books, she mentioned that one of her novels was called Searching for Steven. I knew I had to read it as I have my very own Steven at home – well, Steve actually! Anne Williams from Being Anne, who organised the gathering, said I absolutely had to read Jessica’s books as she was sure I would love them. We often have the same taste in books and she was absolutely right. The bright cheery cover reflects the uplifting story inside. Sarah has just come out of a disappointing relationship and heads home to the Whitsborough Bay on the Yorkshire coast for a bit of TLC from her family. While there, she is offered an amazing opportunity by her auntie, an opportunity which involves setting up a business which would turn her hobby into her work. She decides to go for it and sets about making a new life for herself back home. While moving into her new place, she discovers a tape recording from 12 years previously. The tape is a recording of a psychic reading she had when she was 18. The tape had vanished so she had never listened to it and being rather drunk during the reading, she couldn’t remember the predictions. The predictions and messages on the tape recording are scarily accurate with some already have been fulfilled and others being proved right throughout the book. Most importantly, the clairvoyant says that Sarah will meet her one true love at the age of 30 and that he will be called Steven. And so the search for Steven begins! I don’t really think I believe in fortune tellers and psychics but I could understand if I had come across a tape like the one Sarah found with its accurate predictions, I would be out looking for a Steven too! As you can imagine, Stevens (and Steves and Stevies) suddenly appear all the time in her life and each time she wonders if he could be her Steven. It seemed to me though, and to others, that the perfect man for Sarah was right under her nose even if he wasn’t called Steven. The book is full of well drawn characters with Sarah’s best friends, Clare from London and Elise from Whitsborough Bay, who can’t stand each other, providing some great scenes. Her mum and dad were always so proud of her achievements, her matchmaking Auntie Kay with her own secret about love from the past was determined to help Sarah find her Charlie. And no I haven’t made a mistake with the name, you’ll understand if you read it. 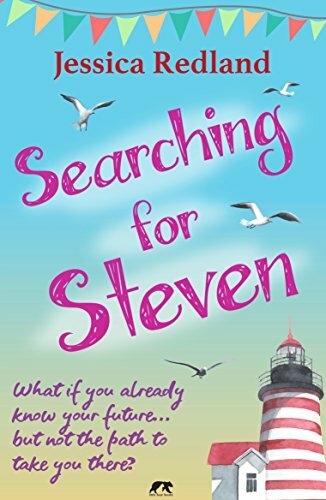 Searching for Steven is a warm, sparkling story with a very satisfying ending. Sarah comes to realise that “when true love comes along, you have to hang onto it with all your strength because it’s worth it.” I know this book is the first part of a trilogy and hope to read the others too at some point.